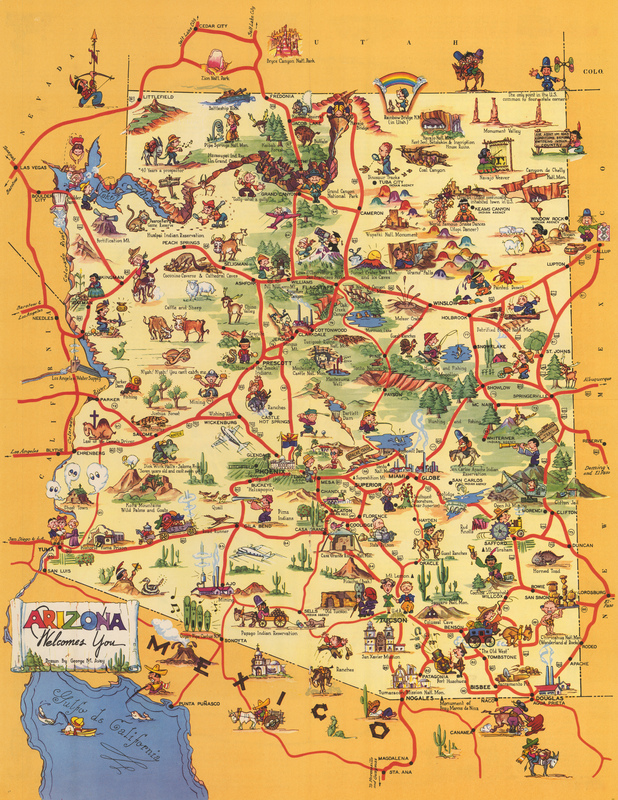 This is a joyful little pictorial map of Arizona by George Avey, produced as "a friendly guide for the traveler in the land of sunshine and scenic grandeur," as noted on the front. The map is filled with colorful scenes of people enjoying a wide variety of outdoor activities throughout the state. Major highways and roads that interconnect the state are delineated in red. Though the map focuses on Arizona, attention is also given to places just across the border on all sides. The verso features text pertaining to the History of Arizona, of which topics include "Pre-Historic," "the Spanish Conquest," "Early Settlers," "When Men Were Men," and "Arizona Today." The other half of the verso describes in detail nearly 60 attractions throughout the state. Condition: The map is in A+ condition, originally issued folded, now flattened.